Cryptocurrency price indicators can help us describe and understand crypto market trends of the past and, in some select cases, even give tentative predictions of what’s to come. The following are some experimental indicators for the price of Bitcoin, explained. Disclaimer: Indicators that depend on a network’s transaction volume will require calibration after Bitfinex, BitMEX and OKCoin start using the sidechain known as Liquid (as of February 14th, only transactions operating between individual nodes and The Rock Trading exchange are using Liquid). They will also require calibration for any network that uses sidechains, state channels, and any other technology that reduces visible activity (number of transactions) on the blockchain. This article’s main source is Blockchain.com, whose estimation methodology has not been disclosed to us. NV (Network Value) is equivalent to Bitcoin’s market cap. DMA means Daily Moving Average. You can click on the graphs to enlarge them. This was later changed in a revision of the NVT ratio, called the NVT Signal (Signal applies MA only to the volatile Transactions component, without smoothing the already stable NV; more about this in the following section). Woo himself agreed that Signal is a more responsive indicator than Ratio. Detect a sharp increase in a new cryptocurrency’s NV: a sharp NVT rise towards the upper limit of the normal NVT range precedes a peak in NV (2011). According to Woo, NVT Ratio can be applied to other cryptocurrencies besides Bitcoin only if another coin’s network shows a strong connection between transactional value and network value. In other words, the value transmitted on-chain needs to be a good representation of how much the network is being used. For example, NVT ratio would be a better indicator for a network like Ethereum than for one like Decred or Dash, where transactional activity results from staking, and is not a good representation of the network’s utility. This indicator factors in total value of on-chain transactions, but not the amount of transactions nor the amount of addresses sending them – two important metrics. NVT Signal still fails to account for number of transactions and number of addresses participating in them; a metric which Kailchkin calls Daily Active Addresses (DAA). NVT Signal does not have predictive power, only descriptive. This indicator was created by PositiveCrypto and published on October 18, 2018. It is not a formula, but a description of the relationship between BTC’s price and the Bitcoin network’s daily transaction values (measured in BTC, not USD). These are related in unsynced cyclical patterns. Because of this, DTVs can act as an indicator for price (showing what market phase the price is likely to enter next). Cryptocurrency price and DTV cycles are unsynced because they’re motivated by different actors: short-term crypto market participants who are dictating short-term price action, and longer-term hodlers and crypto investors who are purchasing Bitcoin on-chain, respectively. The indicator distinguishes three phases. In the Early Bear phase, DTVs drop and prices begin to fall: hodlers have stocked up and will hold BTC in wallets, while others are short selling with their exchange balance. 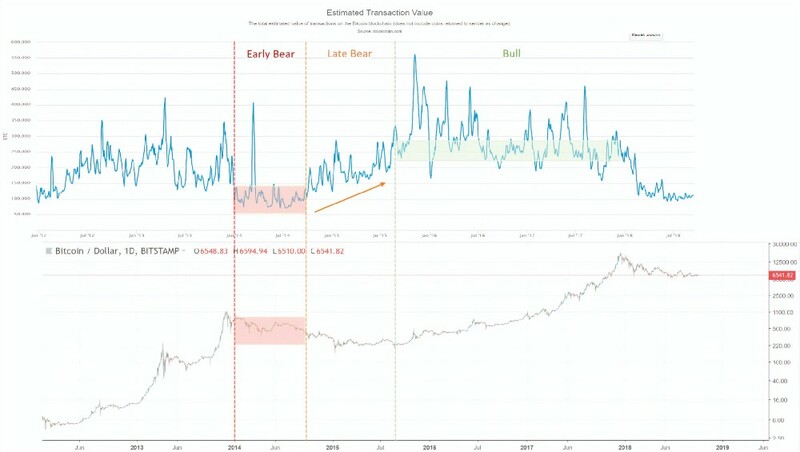 In the Late Bear phase, we see DTVs rising, but the price remains flat: this means an event has made hodlers return to the crypto market, so transaction volume rises and the price stabilizes for a moment. Once daily transactions reach a sustained, healthy minimum, the Bull phase hits; the cryptocurrency market finally responds with a price increase (and it’s always higher than in the last Bull cycle because there are now more coins in circulation). An analysis of the BNM since Bitcoin’s creation up until now conducted by the Trusted Volumes team found that, between January and mid November in 2018, the rise in Bitcoin DTVs preceded a surge in Bitcoin's price by 3 to 4 days with a Spearman correlation of 72%. However, no correlation was found for other time periods. The BNM seems to have held true only during 2018: the stable correlation described by the indicator between DTVs and the price of BTC was found only in certain 2018 market cycles, but not for other periods of Bitcoin’s existence. This indicator was presented by Trace Mayer on 28 November 2017 as a way to compare Bitcoin’s current price against its historical price movements (with a 200-day MA). The Bitcoin Mayer Multiple highlights when Bitcoin is overbought or oversold in the context of longer time frames. Through a simulation, Trace Mayer determined that, so far (there’s no predictive power to this indicator), crypto investors have achieved the best long-term Bitcoin returns when the Mayer Multiple has been lower than 2.4X. Every time the Mayer Multiple has hit above the 2.4X line, it has returned to the average rate of the whole period (1.39X at press time). This indicator is available in real time, through this API. As the Bitcoin market grows and stabilizes with time, the 200-day MA smooths the peaks. The threshold will require calibration. When calculated for a longer time period, the formula produces an oscillator in which two historical thresholds emerge: 3.7, which denotes overvaluation, and 1, which denotes undervaluation. It evokes the results of the NVT Signal and the Mayer Multiple. Puell and Mahmudov recommend analyzing crypto market value and realized value both as a ratio and separately, due to the possibility that realized cap may drop if “strong hands lose confidence in Bitcoin”. It has no predictive function. This is a second indicator created by Dmitry Kalichkin, published on May 22, 2018. Some backstory is necessary to understand the NVM. Metcalfe’s Law states that the value of a network is proportional to the square of the number of its connected users; when applied to a blockchain, to the square of the number of DAA. In an attempt to define Price-to-Metcalfe Ratios (PMRs), researchers from Clearblock divided actual Network Value by one predicted by a few variants of Metcalfe’s law (Odlyzko’s law, Metcalfe’s law and Generalized Metcalfe’s law). Using these three laws as a denominator for the PMR formula gave contradicting results for December 2017 and for May 2018: Metcalfe’s law overvalued the network value, while Odlyzko’s law undervalued it. So Kalichkin used both Metcalfe’s Law and Odlyzko Law to define upper and lower bounds for NV Fundamental (network value), and derived a ratio that is indicative of Bitcoin overvaluation. where n2 – NV is Metcalfe’s law; n ∗ ln(n) – NV is Odlyzko’s law; and a1 = 0.5, a2 = 0, b1 = 1, b2 = 1.43 are the constants which minimize the corridor for NV Fundamental. To be able to assess overvalue/undervalue no matter how wide the corridor is, normalization is applied. The indicator works like this: if a rise in NV is not accompanied by a corresponding rise in network activity, then Bitcoin is overvalued. In some cases this has been applied to other currencies. It does not even implicitly account for crypto exchange activity. The community’s desire to somehow predict the future trends of the crypto market is unceasing, so new research and attempts to perfect these and other indicators – or even create new ones – are bound to keep coming. It is important to always keep in mind, however, that no indicator can have real, complete predictive power over markets. These are study tools which, used with caution, can enlighten future decisions and even guide innovation.